Dazzling purples to blues to greens splash across this Birds of a Feather shawl, producing a fan of glory, to be envied by all. 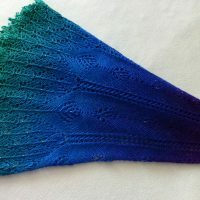 The intricate lace stitches combined with glass beads and silky Vivid Fiber Arts Tencel yarn, lend a sophisticated look to this stunning shawl. Pair it with an evening dress or a casual pair of jeans, whichever the choice, you’ll receive so many compliments, you’ll be beaming with pride. 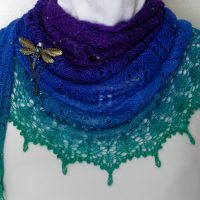 This Birds of a Feather shawl project was such a fun knit. I started with the beginning design in Don’t Panic but added more sections to match the needed amount for the Renaissance Fan spines. 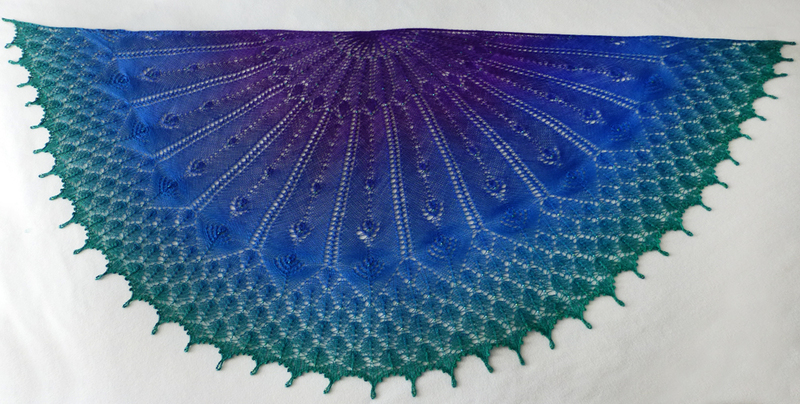 I then blended the second part of Illumine shawl to give more dimension, and finished with the Renaissance Fan pattern. Love how it turned out. 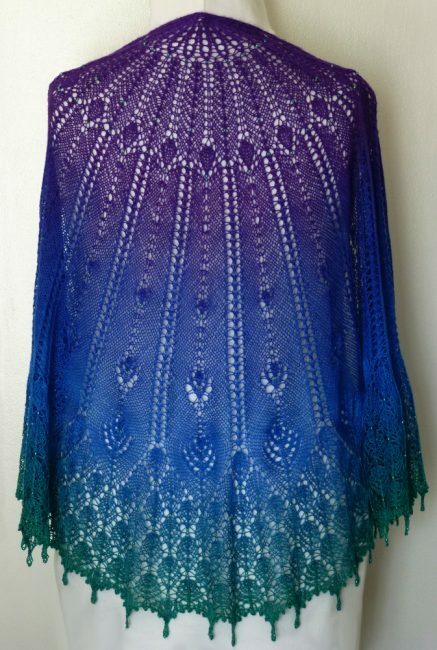 I’d keep it for myself, but I already have a Peacock shawl. Color: Purples, blues, teals, green. Size: One size (S – XL), Measures 60″ wide by 28″ long. Material: 100% Vivid Fiber Arts Lux Tencel. Close up of top edge. 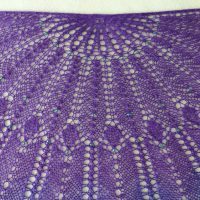 Close up of beaded picot edge. 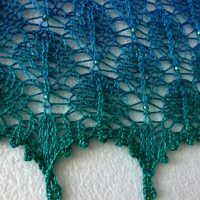 *Special thanks to Nim Teasdale (Renaissance Fan/Illumine/Don’t Panic shawls) for creating such a wonderful pattern and Vivid Fiber Arts for creating such beautiful yarn.